If you are searching the best quality Amazon imported TATTOO INK Primary Color Set in Pakistan then you can buy it from Shoppingbag.pk. The professional tattoo world has the comprehensive set of tattoo inks through which any professional tattoo artist can create any type of tattoo. The set includes 20 basic colors that are required for tattoo making. It is high in quality and safe on skin. 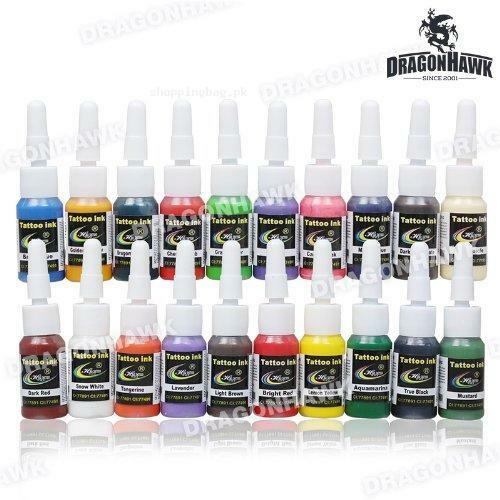 · Each of the tattoo ink bottle has 0.16 oz of ink, which is assorted in shade. · The optimum quality tattoo ink does not fade on skin. · The viscosity of ink is smooth enough for fluent flow to create design. · The shade of the ink is bright and prominent which help to create unique tattoo on skin. · It is originated from USA so it brings the imported quality for the best performance. There are 20 primary colors of tattoo ink in this ultimate and professionals’ recommended tattoo ink set, from the collection of Amazon products in Pakistan. Primary colors include: Aquamarina, grape, bright red, dark chocolate, lemon yellow, True black, tangerine, Dark red, baby blue, mustard, snow white, cherry bomb, dark green, lader, grasshopper, light brown, coral pink, Mario’s blue, golden yellow and creamsicle. It is easy to mix and use to create any of your desired tattoos. Shoppingbag.pk is offering the imported quality TATTOO INK Primary Color Set in Pakistan at the reasonable price. You can get it and buy it from the showcase of Amazon imported products in Pakistan. On order placement, it will import from USA and deliver to you at your home door on your request. You can conveniently pay cash on delivery for getting the satisfactory and contented experience of Amazon online shopping in Pakistan.